While France is celebrating La Semaine du Gout, Palo Alto elementary, middle and high school students have enjoyed their own celebration of flavors and taste thanks to Tasting Week Palo Alto. Orchestrated by a Palo Alto mother of four who was raised in France, Rebecca Scholl-Barbier, and about ten other French-American parents, Tasting Week started on Monday and will run until next Wednesday. Mirroring the French event in place for over two decades, the Californian counterpart in Palo Alto strives to educate children to appreciate taste and flavors, to share and pass on an important part of French culture and to trigger a discussion among parents about school lunches and healthy eating habits. Scholl-Barbier reached out to local chefs who responded positively to participate in the event with food demonstration and tasting workshops. Throughout the week, a dozen of chefs from San Francisco, Palo Alto, Redwood City, Campbell, Big Sur and Mountain View participated in Tasting Week. “The kids love it. It’s a wonderful experience for them. Really, it’s fantastic and I always wanted to bring a chef into the classroom,” said Anne Jensen, one of the Advanced French teacher. Classroom presentations are made in English or in French for advanced French students. Chefs brought samples along to share with the students, and in classrooms that had a kitchen, they demonstrated their skills by cooking a dish sharing their savoir-faire and passion for food. “We gave the the chefs carte blanche” in how and what to present to their young audience, explained Scholl-Barbier. On Thursday, Gerald Hirigoyen, a French-Basque chef and owner of San Francisco’s restaurants Piperade and Bocadillos, visited Gunn High School’s advanced French students. “Tasting week is a great idea. I know it’s important, it’s always a pleasure to talk to kids and participate in enriching experiences,” says the Chef about the event. Chef Hirigoyen talked about his Basque heritage, its culture and culinary traditions. 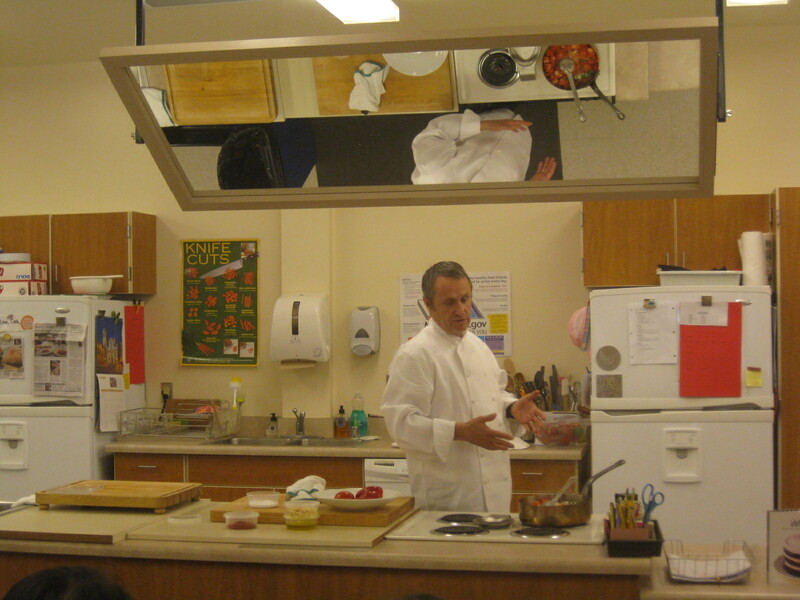 He showed students how to cook a classic basque dish, called piperade, made of tomatoes, red peppers, onions and olive oil. He also brought along two food samples for the students to taste. 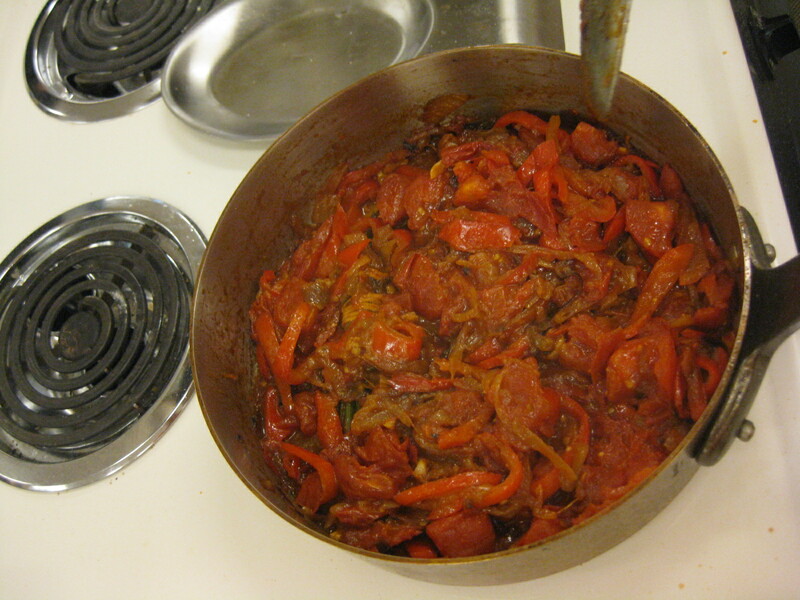 Chef Gerald Hirigoyen's Piperade. At the end of the presentation, the students took back for their French Club meeting. While cooking, Hirigoyen dispensed a few cooking tips: “Too little salt is better than two much because you can always add more but can’t take any away.” And according to the chef, there can never be too much garlic. 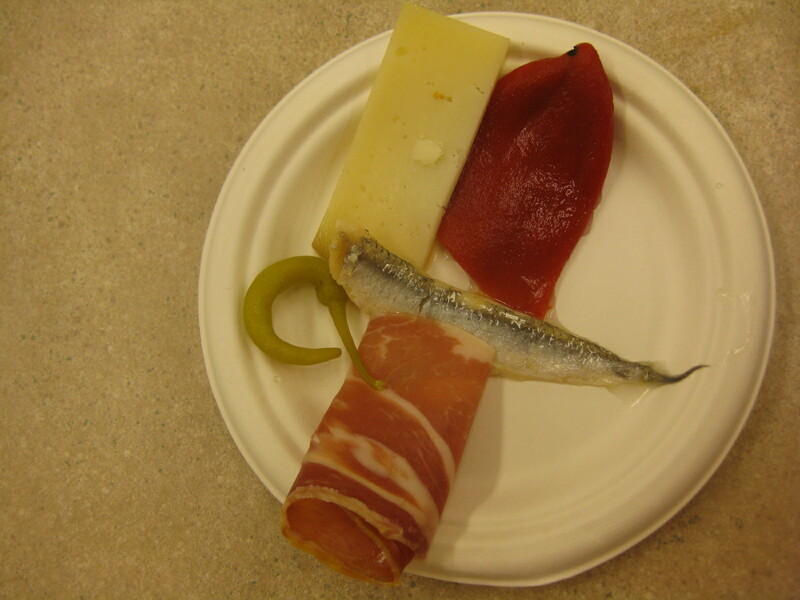 The first taster plate of red pepper, green pepper, anchovies, Cerrano ham and goat cheese was a big success among students who even ate the anchovies. 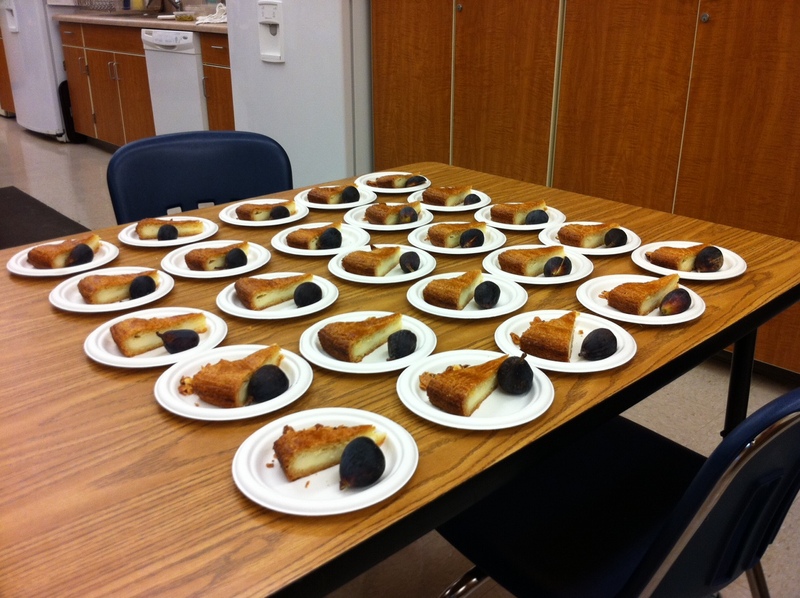 The second sampler featured a basque almond cake with roasted almonds and figs. Basque Dessert Sampler Plate: Basque almond cake with roasted almond and a fig. “That’s the best cake I have ever had. And it was great to learn about the Basque culture,” said 17 year-old Emma Marriott, a Gunn High School student who has been studying French for six years. And in addition to the chef’s classroom presentations, an A to Z salad bar is going through the participating schools throughout Tasting Week. For each letter of the alphabet corresponds a fruit or vegetable. And while most presentations take place in schools and focus on teaching children about taste and flavor, Tasting Week Palo Alto is also about starting a discussion among parents about school lunches and healthy eating habits, explains Scholl-Barbier. So far, the event seems quite a success, and she hopes to see it happening again in the future and even spreading to other cities.